This menu option is used to define validation levels and parameters for pre-defined validation business rules for SPS Cloud EDI. Defines the validation needed when an Incoming PO (850) is received where the Customer Ref. No. is present in an existing Sales Order in SAP Business One. 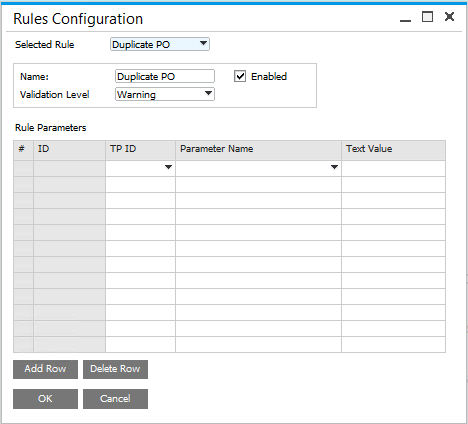 Duplicate PO rules configuration screen, shown here without configuration. Rule name, as seen by message administrators. Enables (if checked) or disables (if un-checked) the selected rule. Warning – Warning alert type will be sent to the Message Manager when a PO (850) is received where the Customer Ref. No. Is already present in an existing Sales Order in SAP B1. The PO (850) will be loaded in SAP B1. Error – Error alert type will be sent to the Message Manager when a PO (850) is received where the Customer Ref. No. Is already present in an existing Sales Order in SAP B1. The PO (850) will be not be loaded in SAP Business One. Leave blank. Not required for this rule. 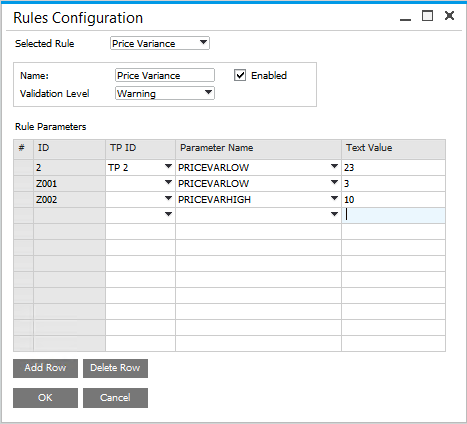 Defines validation rules for acceptable levels of price variance (both high and low variance percentage amounts). Price Variance configuration settings as described in the table below. Warning – Warning alert type will be sent to the Message Manager when a PO (850) is received where the price is outside of the acceptable range, as defined in the settings below. Error – Error alert type will be sent to the Message Manager when a PO (850) is received where the price is outside of the acceptable range, as defined in the settings below. The PO (850) will be not be loaded in SAP Business One in this case. Select the Trading Partner ID if the rule is specific to that Trading Partner. Otherwise, leave this field blank if rule applies for all Trading Partners. PRICEVARLOW - use to define the percentage used to determine the low price value. PRICEVARHIGH - use to define the percentage used to determine the high price value. Low or High Price Percentage (depending on the selected Parameter). Defines rules for validating Inbound PO 850 documents that don't include a PO date, and whether to warn or raise an error during Outbound Invoice 810 document creation. 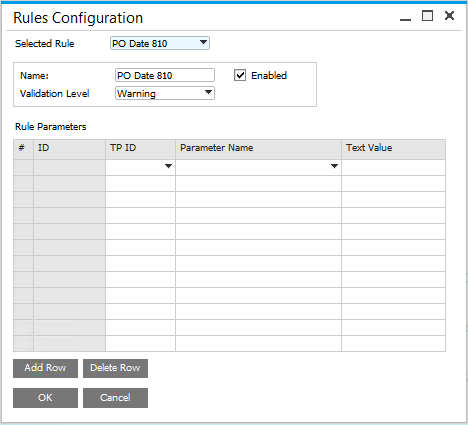 Screenshot of Rules Configuration for PO Date 810. Warning – Warning alert type will be sent to the Message Manager when a PO (850) is received where the PO Date is not set. In this case, the related 810 will use the 810 UDF value. Error – Error aalert type will be sent to the Message Manager when a PO (850) is received where the PO Date is not set. The PO (810) will be not be created in this case.